By thaliakr February 26, 2014 8 commentsbooks, church, church calendar, fasting, food, Lent, neighbours, spiritualityClean Monday, Coptic Church, Eastern Orthodox Church, Egypt, Great Lent, Holy Week, joyful fasting, Orthodox Church, Scot McKnight, Thomas Ryan, What's the point of Lent? This is the third in a mini-series looking at how different traditions celebrate Lent. You might like to start with the first post on Old Testament fasting and catch up on the second on Jesus and the Early Church. It wasn’t until I moved to New Plymouth, next door to a lovely Egyptian family, that I realised how hard-out Orthodox Christians are when it comes to marking the church seasons. Great Lent is not six but eight weeks of fasting, including the week before the 40-day period, and the week after, Holy Week, which is counted separately. Actually, Coptic Christians (who are distinct from, but friendly with, other Eastern Orthodox churches) fast for several holy periods of the year, adding up to around 210 days a year. These guys are serious. Great Lent is intended to be a “workshop” where the character of the believer is spiritually uplifted and strengthened; where his life is rededicated to the principles and ideals of the Gospel; where fasting and prayer culminate in deep conviction of life; where apathy and disinterest turn into vigorous activities of faith and good works. A difference between the Eastern and Western observances is that while in the West the chanting of Alleluia ceases during Lent, in the East its use is increased. The first week of Great Lent [starts] on Clean Monday, the first day of Great Lent. The name “Clean Week” refers to the spiritual cleansing each of the faithful is encouraged to undergo through fasting, prayer, repentance, reception of the Holy Mysteries and begging forgiveness of his neighbour. It is also traditionally a time for spring cleaning so that one’s outward surroundings matches his inward disposition. Scot McKnight, in his book, Fasting, which I’ve been drawing on for this series, feels strongly about restricting the use of the word ‘fasting’ to refraining from eating (and perhaps drinking). Avoiding Facebook or coffee or criticism isn’t ‘fasting’, it’s something else, maybe ‘abstinence’, he’d say. For our church [Great Lent] is 55 days (preparation week, then 40 days Lent followed by the Holy Week). The fast is entirely vegan during these 55 days with no exception, no eggs or dairy products at all. It’s an uplifting time of the year. There is an abstinence period during the day (no food or water) followed by vegan diet. The length of the abstinence is according to stamina. This is what I find most striking about Orthodox Lenten practice – now that I’ve got over the length and extent of the food restrictions. There is a huge focus on joy in Great Lent. Unlike in Roman Catholic Lenten practice (the subject of the next post), Orthodox churches don’t stop chanting the ‘Alleluia’ during Great Lent, because Lent is joyful. That’s a contrast to the sad, grey shades I have often painted Lent with in the past. If you skimmed that – as I often do when I hit a quote – go back and read it properly. It’s a beautiful set of pictures that has changed my sense of what Lent can be. 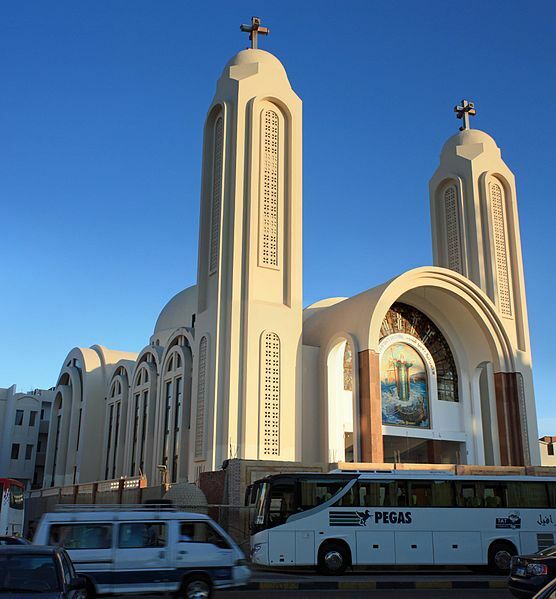 Coptic Church in Hurghada, Egypt, via Wikimedia Commons. Public reading of Scripture also increases during Great Lent, along with prayer. Do you find any of this attractive or thought-provoking? Fasting needs to be connected to acts of compassion and generosity (Isaiah 58). 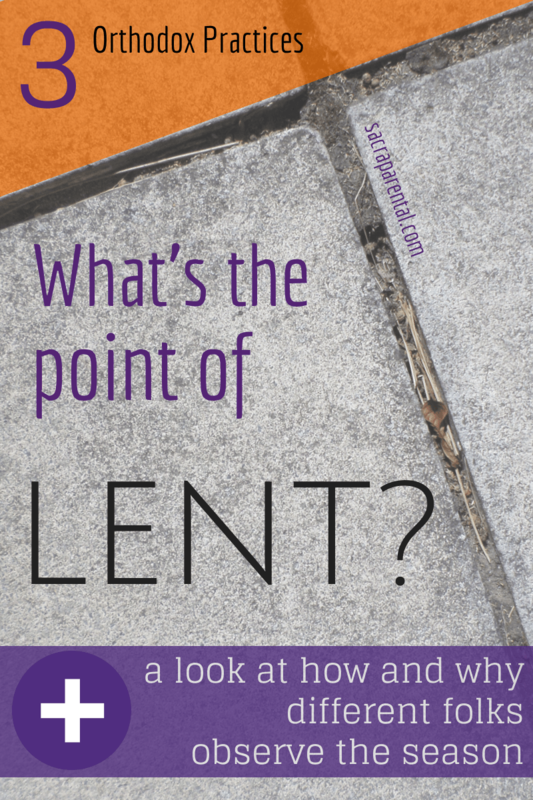 Lent isn’t a holy blip in an indifferent year, but a training step that introduces patterns of holier living (Early Church and Orthodox practice). Lent, and the fasting that goes with it, is a community experience, where we help each other in this extra effort of focus (Jewish tradition and Early Church practice). Easter is serious business and should perhaps provoke a serious, bodily response from us (Early Church and Orthodox practice). Sundays in Lent are for feasting, not fasting (Early Church and Orthodox practice). Lent can have a feeling of joyful anticipation (Orthodox practice). Lent is a spiritual workshop where we rededicate our lives to Christ and are invigorated for active lives following him. (Orthodox practice). Lent can have an element of ‘cleaning’, where we examine our consciences, mend broken relationships and even clean the house physically as a symbolic reinforcement of this (Orthodox practice). Lent can involve increased reading of Scripture and increased time in prayer (Orthodox practice). What do you think? This is purely my own response to what I’m reading, so I’m keen to hear what strikes you as important or helpful. Next up is a look at modern Roman Catholic Lenten practice. I’m especially keen for your input on that – I know lots of you are Catholic and will know way more than me! I’m preparing a Lent with Kids series for Sacraparental, and now for a few friends’ churches, that is inspired by how my family celebrated Advent. Check it out here, and please feel free to let me know what you think, and what I can add or subtract to the plan. Before Lent begins, though, it’s time to party on Shrove Tuesday/Mardi Gras so check out my Pancake Party post at Kiwi Families for ideas for celebrating with your neighbours. You can also see my Lent Pinterest board, and follow Sacraparental on Facebook for extra daily snippets. Come on over! i like that a lot. the idea of joy rather than the “sack cloth and ashes” fasting is good. Yeah, it’s great, isn’t it! And so new to me as an idea! Most of your takeaway points seem pretty aligned to my experience of Lent (not that I’d claim to be good at Lent. Each year – well, each day – brings the opportunity to renew my effort though!). There are some slight differences between the churches I think (I’m Antiochian Orthodox). So, for example, while we don’t “fast” on Sundays, what it means is a lessening of the restrictions: oil and wine are allowed, which you wouldn’t have during the week, rather than “feast”. There are two Feast days that fall within Lent though – Annunciation (25 March) and Palm Sunday, and on those days fish is permitted. And absolutely, fasting from food on it’s own is not the point. Fasting, Prayer, and Charity are all tied in together in Lent (and yep, again, I need to work on this again this year). Thank you for your series. It’s really interesting to read about “my” practices from a thoughtful outside eye, and to reflect that back on myself. Thanks so much for all this detail! It’s so great to hear from you. I like the gradual withdrawal idea (though it makes you guys even more impressive in the sheer length of fasting!). I just checked out the calendar here: http://orthodoxwiki.org/Church_Calendar . I see you have a while till Great Lent begins. I’d love to hear more anytime you want to write.